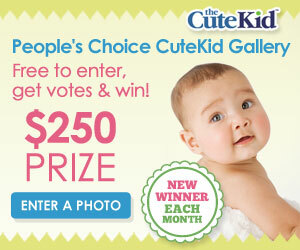 It's Baby Week at Little Birdie Secrets! We have so many baby crafts to show you we decided to feature them all week long. Even if you don't have babies of your own right now, each of these items makes a great handmade gift for the moms and babies in your life. And if you leave us a comment this week you'll be entered in our drawing to win some darling baby items from this week's posts! 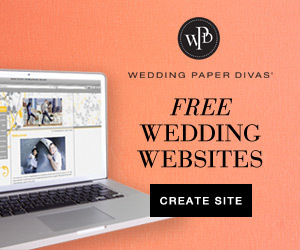 Add a link to this blog on your blog or Web site and you'll be entered twice. Oh, baby! Our first baby post this week has to be one of the easiest, and most appreciated, baby gifts you could give. Most babies love their binkies (my second wouldn't touch one--grrr! 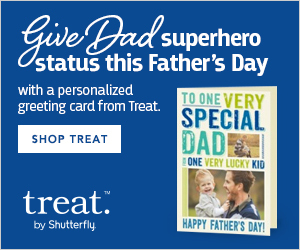 ), but they also love pop them in and out of their mouths, or toss them and watch you pick them up 200 times a day. And when it's something that's meant to go in their mouth, you feel this annoying urge to wash them off each time. This simple baby binkie clip solves all your flying-binkie problems. Until your baby learns how to open Velcro, that is. But at that point it may be time to lose the binkie anyway. . .
1. Apply fray check to both edges of ribbon to prevent fraying. If you don't have Fray Check, just sew a small hem on each end of the ribbon. 2. Thread ribbon through the mitten clip and fold over about 1-2 inches. 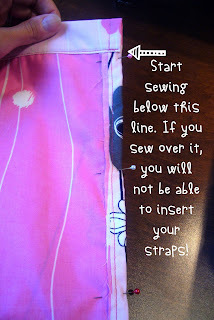 Sew a square and then a diagonal line down the center to secure it. 3. Separate Velcro and use fabric glue to adhere pieces about 1 inch apart on the other end of the ribbon. Or sew in place if you prefer. 4. Attach binkie by threading ribbon through ring and securing Velcro. 5. 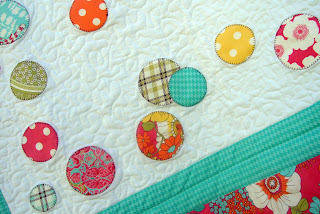 For a little extra cuteness, glue a large coordinating button to the top of the clip. 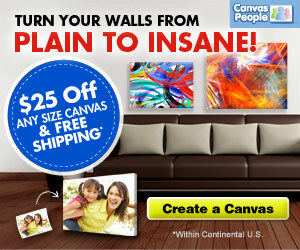 We suggest E6000 or a plastic/glass glue to really make it stick. Clip the mitten clip to baby's collar, shirt, or waistband and just watch her try to throw that thing! Oh, and don't forget to make one to coordinate with every outfit! WARNING: Do not be fooled by the post title. This was NOT an easy quilt. Each flower pot is appliqued, and tiny ric rac was sewn around each square. It took hours upon hours. It's beautiful, but the lucky baby who had this hanging over her crib was terrified of it. Maybe the flower centers looked like dozens of eyes staring down at her while she slept. 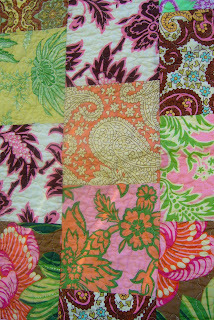 This quilt was not simple, either. Look at all those adorable forms of transportation for a kid to discover while he's fighting a nap. This also included hours of applique, not to mention all the time cutting out those intricate shapes. This blanket is never found on the owner's bed. You know what is? 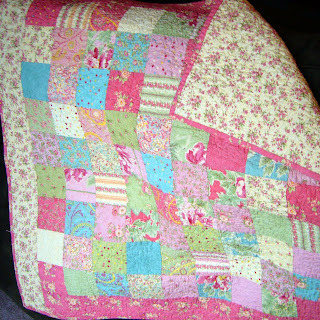 A simple fleece blanket that involved no sewing. This quilt, as cool as it is, turned out to be a totally unappreciated endeavor. Sometimes all our hours of work on a quilt seem like a waste when others don't love it as much as we do. 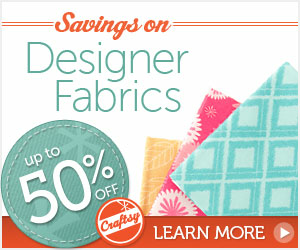 But, for those of us who live with the quilting bug, we still need to quilt, right? Today we'd like to offer some advice to all of you quilters out there, experts and novices alike. Simplify. Each of the following quilts was made primarily from pre-cut fabric. Cutting fabric is my least favorite part of the process, and can take hours (especially if you're geometrically-challenged like me). and cutting, hoping to have enough squares. They came washed, ironed, and cut, ready to be pieced. She offset the blocks to make a brick pattern and skipped the border altogether. 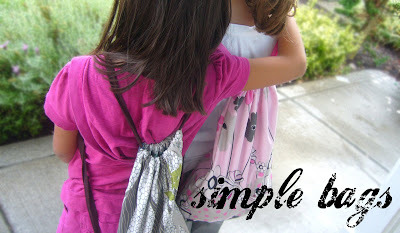 She found a simple backing (not an Amy Butler print, so it was cheaper) and used the same fabric for the binding. The quilting is a large stipple. 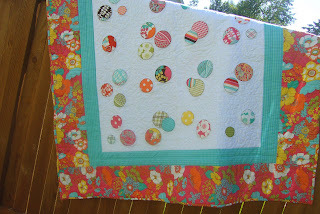 This gorgeous quilt is simple, economical, and beautiful. 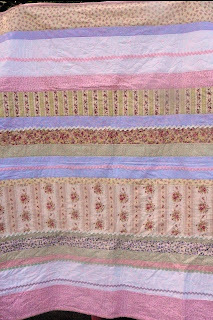 This sweet baby blanket was also made from pre-cut squares on eBay. It took two packs of 4" x 4" squares to complete it, plus a small border, backing, and binding. It's finished with small stipple machine quilting. This baby quilt is even easier than sewing squares together. It's just strips of fabric, cut at the cutting counter where it was purchased. It's as wide as the bolt, then each strip is either an 1/8 of a yard, a 1/6 of a yard, or 1/4 of a yard. The strips were sewn together, then a few pieces of ric rac and other trim were sewn along a few of the seams for added interest. The quilting is very simple--just a few wavy lines across the strips. A fun and fast project. 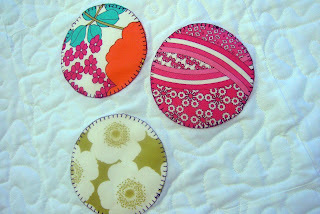 If you love buying fabric, you have to love Moda's charm packs. 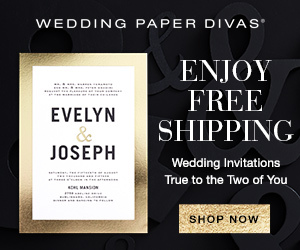 Just like sellers are doing on eBay, these pre-cut squares from the manufacturer feature most or all the fabrics in a designer's line, just to give you a little taste (at a little price). Stacy saw this cute pattern from Me and My Sisters Design called “Seeing Spots”. She loved the way it looked and decided to make it, but change it up a little for a more mature look. She used the charm pack for Moda’s Urban Chicks Summer in the City line. It is hard to find much of that line now, but Moda has some great new lines coming out. All you need is a charm pack and some additional yardage for a the background, border, binding, and backing. Trace the circles in different sizes using household items, like a drinking glass. Okay, so this one did take a teeny tiny bit of applique action, but a circle is a lot less difficult than some of those shapes on the quilts above! There is absolutely nothing wrong with creating beautiful, intricate quilts that take painstaking hours to make. That satisfies a need in many of us to be sure. But don't be afraid to give yourself a break once in a while and make something fun and unique that is also simple. 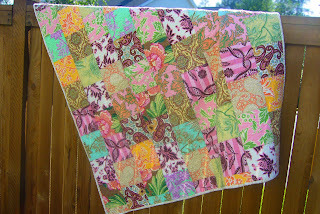 That satisfies another need altogether--the need to have a finished quilt! 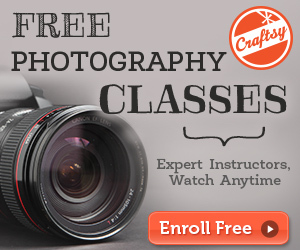 I have always wanted to learn to re-upholster furniture. Once my mother-in-law and I bought fifteen yards of beautiful upholstery fabric to recover a thread-bare love seat I had. We took detailed pictures of how it looked "before." We planned to take all the old fabric off and use it as a pattern to cut the new fabric. She is one of those people who can figure out a project with minimal instruction. I was basically just going to be there for support and to observe. It was going to be a piece of cake. But then kids came along, she got extremely busy at church, and to make a long story short, seven years later I still have the bolt of fabric we bought. The love seat is long gone. It was just such a big project to tackle. My friend Heather is another one of those people who can just take a project and figure it out on her own. She's not afraid to try anything. 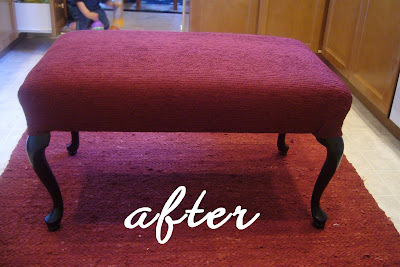 When she offered me this free hand-me-down ottoman in need of some serious TLC, I decided to let her help me recover it. I'm such a good friend. I found a fabric remnant I liked for $4 and purchased a matte finish black spray paint. Then I got out my staple gun and called Heather. We took off the old fabric using the end of a hammer to pull out the nails. Then we took off the legs and spray painted them black. 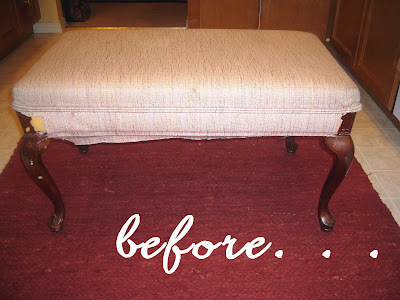 After they dried, we put them back on and added a new layer of batting to make it a little softer than the original bench, stretching it across the top and stapling it to the underside. Then we started playing with the fabric. It took a few tries to figure out what would look best. 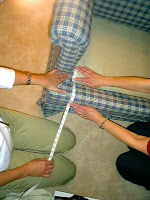 Basically we just stretched it across the top and turned the ottoman upside down, then we started stapling along the sides, keeping the fabric pulled taut. Okay, she was doing all the stapling because I was too nervous to mess it up, but I did stop Ethan from eating several discarded nails! When we got to the corners, we folded the fabric so it looked nice, cut out a little fabric where it was too bulky, and stapled it down. Again, it took a few tries to make them all four look right, but really, that's all it took. That and some serious sugar to occupy the kids so they'd keep their hands out from under the staple gun. And here's the final project. Total cost: $6. Stacy just recently completed a very similar project using some fabric in her stash that she loved but didn't know what else to do with. A vintage piece, some fresh paint, and a few staples and voila! Restyled into a hip piece of furniture! Your local thrift shops and have tons of things like that just need a little paint and fabric to bring them back to life. And it really is easier than you think! Stacy was bored one afternoon and needed a quick sewing fix (how she has time to be bored is a mystery--that girl is always busy!). She came across this great tutorial for an adorable childrens' hat from Mushroom Villagers. She decided to make one in in this cool dark denim. Here’s how it turned out. . .
We need a picture of a cute boy in this hat! Check out the Eddie Cap Flickr group for some other great fabric choices, like wool felt and corduroy. I wonder if you could make this in a womens' size, too. My sister has a couple of similar hats made from canvas with cute snaps on the sides. 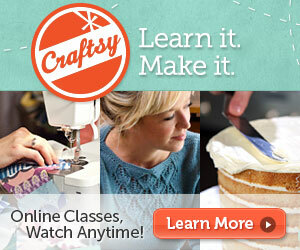 All you crafty seamstresses out there, show us what you've got! Congratulations, Barbara! 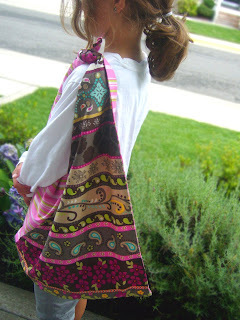 Your little "E" is going to look so cute at school with all her new stuff! Please e-mail us at littlebirdiesecrets@gmail.com with your contact info so we can send you your fabulous prizes--something from each post last week. And thanks to everyone who entered and linked us to their sites! We'll be hosting lots more giveaways, so keep coming back!